Dragons in China are not the lumbering, hoarding, agents of evil that their western counterparts are. Instead they are embodiments of divine power. Chinese dragons are intermediaries between heaven and earth, and rule over the cardinal directions (north, south, east, west.) 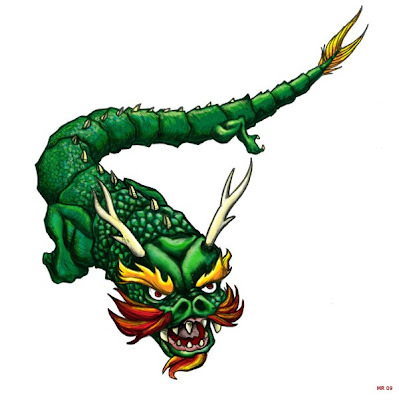 Throughout history they have been represented in many different forms in Chinese traditional art, however the archetype that eventually emerged is that of a long, undulating, coiled serpentine form with beard and whiskers, brightly colored, carp-like scales, horns like a stag or antelope, and sometimes highly stylized wings (which also resemble the horns.) Traditional depictions have dragons with four digits, while the red Imperial dragon has five.